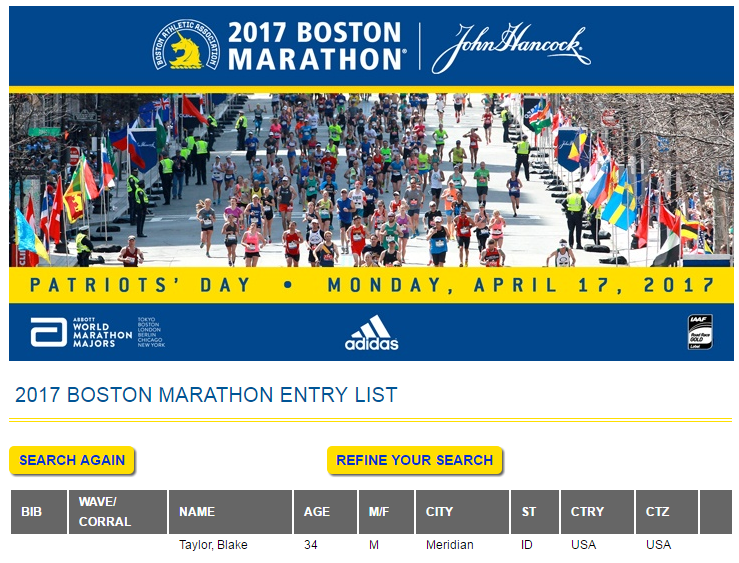 Today I was accepted into the 2017 Boston Marathon. While I’ve known for a few months that I would likely get in, receiving the acceptance email has re-stoked my excitement and commitment. It has been a long road since I first dreamed of Boston — a 4000 mile road, as a matter of fact. On October 5, 2013, I ran the St. George Marathon with my father-in-law, Jerry. This was my seventh marathon; however, I hadn’t run a marathon since the Hoover Dam Marathon in 2009, so I was unsure what I was capable of. The fast course and my preparation combined for a new marathon PR: 3:24:53. After the race, I realized that I could potentially get my time down enough to qualify for the Boston Marathon some day. For my age bracket I would need a 3:05:00 to qualify. The following year I had mixed results. I had some knee pain in December 2013 which meant very few miles. I was still able to drop my PR to 3:21 at the nice Phoenix Marathon course the following March. I experimented at the Utah Valley Marathon in June by going out fast on the downhill, but it led to a huge bonk and a lot of pain. Then in the summer of 2014 my exuberance led to a couple injuries. First I strained my calf. Then, after my calf recovered, I strained a tendon in my foot. I still managed to run the St. George Marathon again in 2014, but I had to take it easy due to my sore foot and I got 3:34:18. I took training fairly easy through December 2014. 2015 was a great year. I trained hard all spring without injury and I thought I was on track for a sub 3:05 for the Newport Marathon in May. However, I had some knee pain in the two weeks before the race and then I bonked again and only squeaked out a 3:13:48. Although it was a nice PR, it was a big disappointment as I was really hoping to qualify. Nevertheless, I trained hard over the summer and was able to finally qualify for Boston at the Mt. Nebo Marathon on September 5 with a 3:04:18. I was ecstatic! However, my hopes were dashed when the Boston Athletic Association lowered the cut-off time from 3:05:00 to 3:02:32 and my registration was rejected. Despite the big disappointment, I still PR’d in every distance 10K or more in 2015, so it was definitely a banner year for my running. I also fit in the Foothills 50K Frenzy in October — my first time running more than a marathon. After a light December 2015 to heal my calves and knees, I hit it hard again in January 2016. Again I had an excellent winter/spring training regimen, doing three quality runs per week and two or three cross training days. I waffled on which marathon to run, but ultimately selected the local Famous Potato Marathon, which has a pretty nice, slightly downhill course. My marathon went as well as it could have, and I achieved a new PR of 2:58:15, breaking the 3:00 barrier and securing a nice Boston qualification cushion. I ran the Morgan Valley Marathon in late July and nearly broke 3:00:00 again despite the more difficult course (high elevation) and a smaller taper. Finally September rolled around and I was able to register for Boston on Friday, 9/16/16. I awaited confirmation anxiously all weekend and checked my email like a crazy person. This morning (Monday) the confirmation came through. I was elated and relieved. 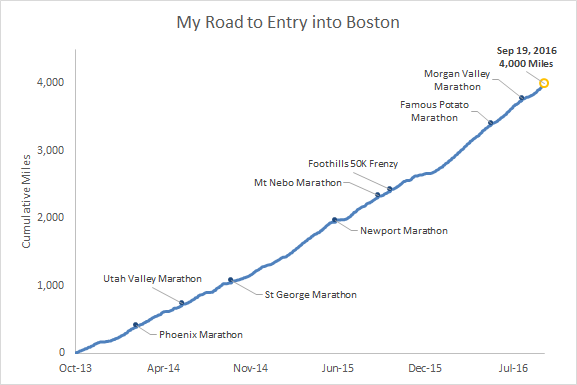 I looked up how many miles I have run since the 2013 St. George Marathon: 4000 miles exactly! (OK, 4000.19 miles.) What a number! In addition to the 4000 miles, which took 493 hours 19 minutes, I’ve also done a few hundred hours of cross training. I think back on all the early mornings, running in the dark, running in sub freezing weather, on icy roads, driving by myself at 4:45am so I can run on a hill, etc. I’m not sure why I do it. Something about the challenge and trying to get a little faster and a little better. Trying to achieve whatever goal is next. At one point I thought that once I made it to Boston I would relax and scale back my running. I doubt that now.